DO YOU HAVE A GRANDSTAND FINISH? Isaac Burns Murphy leads my focus on Black History Month. Mr. Murphy was born in 1861. By the age of 14 he had won his first horse race. He was the son of a Union soldier who died in a confederate POW camp. His first win came nine years after Oliver Lewis another African American, won the first Kentucky Derby. 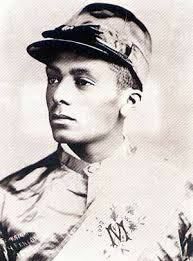 Mr Murphy won three Kentucky Derby races in all and is only one of two African Americans to be placed in the National Museum of Racing’s Hall of Fame. The other is Willie Simms. But his most notable contribution to this sport was evident with his technique of pacing his mount for a charge down the homestretch. This technique was later described as the “grandstand finish”. He was also the highest paid athlete in the United States, making $20,000 a year at his peak. What is it that you can make unique to what you are doing?